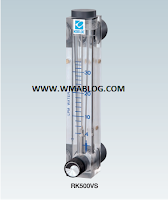 This acrylic resin flow meter is designed for measuring large flow. The flow meter integral with a transparent acrylic panel permits easy reading, coming in two types according to the direction of flow – one from bottom to top and the other on the back side. It can be mounted on a panel with a support metal. The acrylic panel is made integral. The flow meter can be used for measuring water at up to 75 L/MIN. Simple structure and low price. Remarks : Models with a valve are S (direction of flow) only.